A lot of horses that don't intend to play the higher level games can get along in life quite nicely if they get this far on the training tree. If a horse has rhythm, relaxation, and freedom of gaits, if a horse accepts contact on both reins, can move straight, and is balanced, then that horse is farther along in his training than 90 percent of the horses out there. He’ll do OK at lower level competitions and be a real pleasure as a trail horse. If you want to play the upper level games, however, the horse needs to continue his body building program. He needs to develop impulsion, suppleness, and learn how to be on the rider’s aids so he can achieve true collection. These are the skills he needs to be a grand prix dressage horse or a super reining horse or a really agile cutting horse. The horse has rear engine drive. Impulsion describes the powerful thrust from the hindquarters that propels the horse forward. Impulsion is the surge that occurs when the horse’s hindquarters push off the ground. With impulsion, there’s an elasticity and spring to the horse’s forward movement. A rider needs an independent seat and an understanding of how to coordinate aids in order to ask the horse for impulsion. The only place you can actually see impulsion is gaits like the trot and canter that have a moment of suspension (there’s always a foot on the ground when the horse is walking so you won’t see impulsion at that gait). The more impulsion a horse has, the longer that moment of suspension will be. Think of a jumper’s take off or a dressage horse doing an extended trot and you can picture impulsion. To check to see if you have true impulsion, pick two spots in your arena. Ride at an ordinary, working trot and count the number of strides between those two points. When you come around again, ask the horse to lengthen, to give you a bigger stride with more impulsion from behind. Count the strides again. If you actually have impulsion, if you get the lengthening, there will be fewer steps between the two points. If you get more strides, if the horse quickens his strides when you add a driving leg, he hasn’t yet developed the muscles to create impulsion. If you aren’t sure if you’re really getting impulsion, this is a good little exercise to test yourself. Eventually, you are going to be able to feel it without counting. But when you’re initially trying to develop a feel for impulsion, pick two points and count your strides. Impulsion is a power surge that doesn’t have anything to do with speed. It means the horse is pushing more powerfully with his muscles, not moving them faster so he gives you more strides. Impulsion does not have anything to do with excitement, either. You don’t use louder, more exciting aids to create excitement in the horse in hopes of getting impulsion. If you use raise the horse’s excitement level, then what you get is a horse that feels excited rather than one that feels the shape his rider is asking him to take. Horses don’t do equations very well. You can’t expect that if you did this thing a week ago and another thing two months ago and something else yesterday that the horse is going to be able to add them up and come up with something new. As a horse progresses up the training tree, you have to be “layering” his training. That means that the new thing you are asking him to do is just one step or at most two steps away from everything you’ve already taught him. This is true both mentally and physically. A lot of people who have no trouble understanding the mental layering forget that there’s physical layering and learning going on here, too. Just as a rider has to develop the correct muscle strength and muscle memory in order to apply and coordinate aids, the horse has to develop those skills, too. If you rush the horse and ask for impulsion before he has the skills and muscle strength to respond correctly to your request, you risk developing the wrong muscle memory. That’s why you have to go through a specific training sequence before you can ask for impulsion. The horse has to respond physically to rein contact and has to develop both sides of his body equally and become straight before he’s got the muscle strength and muscle memory to go on the to impulsion. To give you a longer, bigger stride, the horse has to use his hindquarter muscles to surge off the ground. He has to have a relaxed, strong back to do this. He has to be balanced. 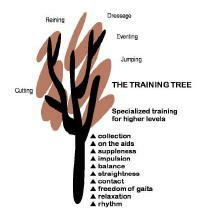 If you wind up retraining a horse that has been rushed into impulsion before he was ready, you are going to have to back down the training tree to the level he doesn’t understand and come back up slowly from there. Everything on the lower levels of the training tree needs to be there first in order for the horse to be able to carry himself correctly and have the properly developed muscles to produce impulsion. If you don’t have straightness you’re not going to have impulsion. If you don’t have balance you can’t get impulsion. So again, the key is those sequential steps. As you move on to the upper levels, choosing a good partner can make your training job easier. Some horses are just naturally more athletic than others. Their conformation works for them, not against them. These horses have the potential to develop faster with fewer training plateaus than the horse whose conformation is less than perfect. Temperament comes into play here, too. But if you have the patience and take the time, there’s no reason you can’t take whatever horse you’re working with and improve his capabilities.